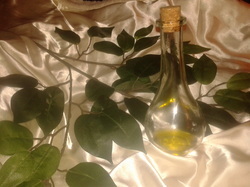 The baby is anointed with blessed organic oils (hypoallergenic) with a circle, the symbol of eternity (or a mark of your choosing, such as a cross or a sideways figure eight infinity symbol). The Crown, Brow, Heart, Hands and Feet are anointed, each with a specific blessing. We have gathered together today to celebrate the birth of baby on birthdate . His/Her parents parent and parent have asked us to participate in the blessing of this very precious and new life. We welcome baby to this world and family and community of friends. We join parent and parent in wishing the very best for baby . We pledge our support and guidance to them and to baby in helping them raise him/her to his/her fullest potential. We give thanks and are filled with gratitude to be a part of such a special person and are all connected in our care for him/her. We welcome you baby . We embrace you. We wish for you every good thing. You are the missing piece to all our puzzles and we are so excited to be a part of your life's journey. Welcome. We have been waiting. We are so happy that you are finally here to share moments and memories with us. Welcome! Welcome! Welcome! these are the gentle years. these are the rainbow years. these are the tender years. Anointing the Crown: May you always be watched over and guided by the creator/the moon and stars/the heavens. Anointing the Brow: May you always see your path clearly and follow your dreams. Anointing the Heart: May you always experience the world with an open heart, loving and being loved. Anointing the Hands: May you always reach out your hands to help others or when in need. Anointing the Feet: May you always remember your roots and your connection to your family. May you walk this world blessed with happiness, good health and prosperity. May you carry with you hope wherever you go. May you be given every kindness and be kind. May you be aware of the world around you. May you be full of gratitude for the gift of life. May you be forever blessed in all that you do. To prepare ourselves for the world. we are ready for the world. parent and parent , I say on behalf of all of us, go in peace and build a strong and beautiful family life. Your wishes are rooted in truth, for we have joined our hearts and hopes and blessings with yours. Your wishes are our wishes, that you might have a home that is full of love and positivity for you and your child. May baby grow up to reflect the best in both of you, and extend unto the world he/she touches, the love he/she receives from his/her mother and father. Do not fear for the universe/the creator/the stars/God will guide you always. Blessings upon you both and infinite blessings to your child.